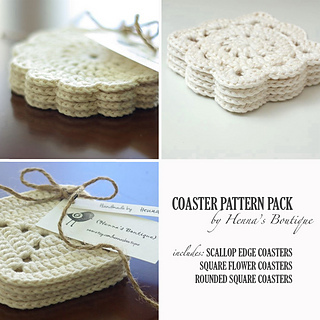 Round scallop edge coasters: 4.75" (12cm) diameter each. Square Flower coasters: 4" x 4" (10cm x 10cm) each. Rounded Square coasters: 4" x 4" (10cm x 10cm) each. Round scallop edge coasters: 4.75” (12cm) diameter each. Square Flower coasters: 4” x 4” (10cm x 10cm) each. Rounded Square coasters: 4” x 4” (10cm x 10cm) each. The patterns are detailed with easy to follow written directions. They written in standard American terms. All used abbreviations are listed and explained in the patterns. The patterns also provide needed yarn amounts and crochet hook size in both US and metric systems. Please use these patterns for personal use only. Please do not copy, distribute or resell these patterns.